In the years following World War II, the relations of the Soviet Union with nations of the West underwent a fundamental change. A “cold war” began, and during the 1950's, the US began to actively pursue a politics of balance on the brink of war. This led to a significant aggravation of international tensions, escalating the threat of a new world war. Nations of the West dramatically reduced trade, economic, cultural and other ties with the Soviet Union. The bourgeois press portrayed the Soviet citizen as an enemy and potential aggressor. An important role in conducting this campaign was given to the US Navy, while the military threat from the seas was becoming all the more real for our country. Under these conditions, the Naval Forces (the Soviet VMS [“Naval Forces”] were renamed to the VMF [“Navy”] on September 10, 1955) were one of the operative diplomatic tools in conducting a politics of peace, in preventing and restraining aggressive ambitions, and in countering threats to our national security. One of the means of implementing this all-important mission became the friendly visits of our ships to ports of foreign states. A battleship provides visual evidence of nation's scientific, technological and manufacturing prowess. This fact was widely taken advantage of by imperial states to intimidate potential adversaries. The visits of our vessels always bore the spirit of amity and demonstrate the high cultural level of our sailors. This serves as a great countermeasure against attempts of the bourgeois press to characterize us as enemies and crass barbarians. Foreign calls promoted the growth of sympathetic and amicable feelings toward our nation, strengthened mutual understanding of the people, and raised our nation’s level of international influence. During the first postwar decade, our military fleet was augmented with new ships, new military technology and armaments that could hold their own against foreign standards. Sverdlov-class cruisers (Project 68 Bis) began to enter service during this time. They were intended for operations as part of a squadron during the mobilization of a light attack force, as well as for support of naval patrol and reconnaissance missions, and squadron defense from attacks of light enemy forces. These cruisers were the most highly perfected and most powerful artillery vessels, and became the pinnacle of the state of the art in the evolution of Russian naval engineering. Undoubtedly they surpassed their English counterparts, which were under construction in the mid-50’s. The supremacy of the Sverdlov-class cruisers in coastal-target artillery was especially significant. It should be noted that after 1945, the number of shells in the caliber range of 152-406 mm fired at coastal targets in local wars was comparable to the overall amount of ammunition of that same caliber used during World War II. At the beginning of 1953, the Soviet Naval Forces received an invitation to participate in a parade of the Royal Fleet on the Spithead roadstead at the Portsmouth Naval Base, to celebrate the coronation of Her Royal Highness Elizabeth II. This was to be the first official friendly visit of a Soviet vessel to a Western-European naval base in the postwar era, and for quite an important occasion. The mission fell to the flagship of the newest postwar design series 68B – the Sverdlov. Preparations of the crew and ship for the mission took three months. The day before sailing out of the fleet's main base, the city of Baltiysk, the Minister of the Navy of the USSR, Admiral N. G. Kuznetsov, arrived aboard the cruiser. Addressing the cruiser's crew, he declared, "You are charged with a serious mission by the government, and while carrying it out, you can either help the government in furthering diplomacy, or you can hinder it. I am confident in the success of your endeavor!" Awaiting the parade on the Spithead roadstead, over 200 vessels of the British fleet and guests of the Queen had gathered. 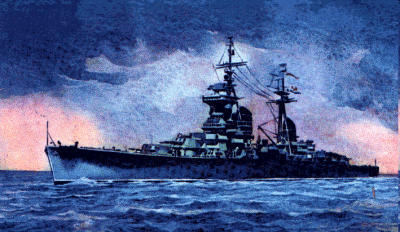 The cruiser had to perform complicated maneuvers to find its spot, indicated with a marker buoy with the national flag of the USSR. The cruiser’s commanding officer, Captain of the 1st Rank Olimpiy Ivanovich Rudakov, declined the pilot’s help and took the ship's helm himself. Upon entering the roadstead, a nations-salute volley rang out. The cruiser headed for its anchoring berth. The mooring method of anchoring was to be used, a method that requires the highest professionalism from the boatswain team, and extremely high precision in handling the mammoth vessel from its commander. According to standards of the time, for vessels with a displacement of 12-16 thousand tonnes (such as the Sverdlov), a mooring time of 45 minutes was considered excellent. Our fleet doesn’t even employ this technique unless absolutely necessary. The salutory volley exchange drew the attention of all those present on the roadstead to our ship. The Sverdlov arrived at the anchoring zone, only to find the marker buoy missing. (Subsequently the ship’s captain received an official apology regarding the absence of the marker buoy.) Navigators quickly establish that no mistake was made -- the cruiser came out correctly. The order is given and the first anchor sent to the roadstead’s floor. All eyes are on the cruiser, observers start their stopwatches: timing has begun. The English officer that had come aboard the cruiser also starts his stopwatch. The mooring results of the previously-arrived ships are well-known: the American cruiser – 2 hours, the French – 4 hours, the Swedish -- even longer; attendees had already given up waiting for the completion of their maneuver. The Sverdlov was moored in 12 minutes. It was a triumph. The cruiser remained anchored at the roadstead for a week, enjoying an unfailing popularity with the locals. There was constant activity aboard the cruiser: groups gathered to take snapshots, small athletic competitions were held, the onboard Red Banner-decorated Baltic fleet’s Ensemble of song and dance imitated the recreation of sailors on the upper deck with spontaneous songs and dancing. The exemplary marine training of the crew, the high-class demeanor of our sailors on shore, and the intriguing recreation of the sailors on the maindeck of the ship drew a favorable response in the British press. The parade was held on June 17. All vessels are in full decoration. The crew is lined up along the ship's side. Dressing-flags flap in the wind. The sailyard of the foremast is flying the British and Soviet flags -- this is our salute to England's Queen and her fleet. Elizabeth II sails a yacht along the ship formation. Our sailors greet her with a mighty triple ”Hooray!” After the parade, the Queen gives a traditional reception for the naval elite on the fleet’s flagship. Senior officers are not subject to invitation, but O. I. Rudakov, despite having the rank of Captain of the 1st Rank, received an invitation, and even had the honor of being one of the first to greet the Queen. The festivities concluded with fireworks and lights. The celebration and our cruiser's entire stay on the Spithead roadstead were a great success. According to our embassy in London, the cruiser Sverdlov’s sojourn in England played a bigger part toward winning over the heart of the people of Great Britain than years of painstaking diplomatic efforts. After the conclusion of the festivities, the cruiser successfully returned to Baltiysk. It received a champion’s greeting at the base. The ship was visited by the Minister of Defense of the USSR, N. A. Bulganin, who personally awarded each crewmember. The ship’s captain O. I. Rudakov was promoted to the rank of Rear Admiral and awarded the Order of the Red Banner of Combat. A radio concert was given in honor of the cruiser Sverdlov. Subsequently, friendly calls and functional visits of Soviet military ships and auxiliary vessels to ports of foreign nations became a widespread phenomenon.